During World War II , American pilots were given hollow metal spheres to be used when their planes went down over water. The spheres, being rather heavy for their small size, didn’t exactly act as great flotation devices. So why were these pilots given chunks of metal? Well, they were told that if they dropped the sphere into the ocean, their current position could be worked out by allies in the region, and they would be rescued. However, as foreign intelligence was soon to find out, the spheres were just that – hollow metal spheres – no electronics, no radio equipment, no imbued magical properties. So was the military just playing with it’s pilots, or was there actually something to these spheres? Well, some of the details are still kinda top secret, but with a little physics and an active imagination, it’s possible to work out how they were used. Arrgh! Scary! I just said the P word. Don’t worry, I’ll try to summarize things without delving to deep into the physics. 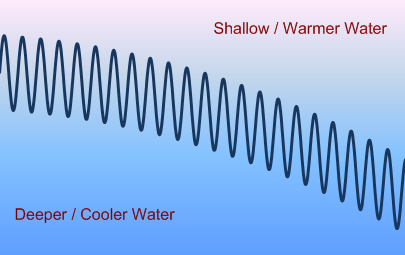 Normally, the temperature difference of water is quite gradual as you go deeper; however, there is a zone (at around 500m) where the temperature change is quite rapid. Therefore, any soundwaves entering this area, will be bent down. 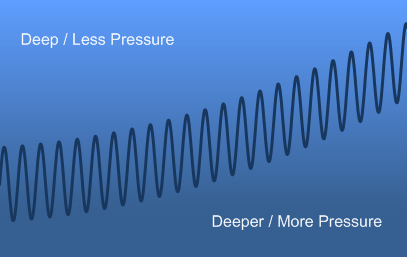 Once you are past this zone, at around 1km deep, the pressure becomes the dominant effect, and sound will bend upwards. 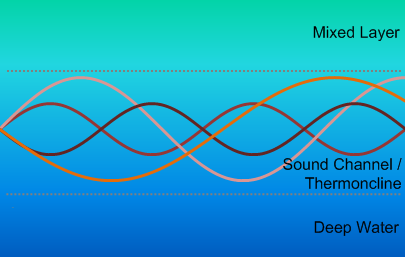 Note, if a sound originates outside of this channel, it gets deflected somewhat, but doesn’t bend back enough to get trapped. Note also, that the lines here show the path of the wave, not the wave itself. View each line as a zoomed out version of the wave pictures above. So, the spheres that the pilots were dropping into the ocean were of a specific thickness that would be crushed by the ocean pressure at about 1km deep. This would cause a “ping” that could be detected by underwater microphones thousands of miles away. By triangulating the sound (kinda like how GPS works) the Navy was able to work out where the sphere was dropped and go rescue the pilot! I don’t believe it – I am about to recommend a Tom Clancy novel, The Hunt for Red October. Tom goes into details as to how the US Navy took this technology and used it to detect submarines that entered the sound channel. I’d totally recommend buying it here for those of you who have enjoyed reading this posting. It turns out that nature beat us to the punch. Whales have been using the sound channel for years to communicate with each other over long distance via Whale Song! The Hunt for Red October – get it on Amazon here. You have presented solid facts. Actually, I’m pretty sure he presented hollow facts. I just got linked here and wow, that’s some insane physics, how did they even know that the channel existed, was it know from whale research? You made Reddit. Yay. Quick points: It’s “Tom Clancy”, not “Clancey”, and it’s “The Hunt for Red October”. The History: During World War II, American pilots were given hollow metal spheres to be used when their planes went down over water. Metal, as you probably know, tends to be quite heavy and quite useless as a flotation device…. Just found this blog via my control panel, wow – fascinating stuff! WW2 engineers and physics professionals were well aware of the thermoclines. These were used extensively in submarine warfare. Subs that shot torpedoes would dive below the thermocline, which would deflect the sonar pings from ships seeking them. I doubt they gained this knowledge from studying whales, and more likely obtained in from physics experimentation with sonar devices. … which is why it is never used for things like aluminum canoes or steel aircraft carriers. But on retrospect, clumsy is better than misleading (esp when it comes to science based posts) – I’ll change it a little. The knowledge of acoustics necessary to do this was not available during WWII. The kind of acoustic receivers needed (long arrays are required to get sufficient directionality to pinpoint the noise at distance) were not available. The thought of putting an array down in the channel was not there then, either. As WW II began, the US established a set of defense-oriented laboratories: MIT got radar (and set up the Radiation Laboratory); the University of California got nuclear weaponry (and set up Los Alamos); Columbia University got sonar and set up the Underwater Sound Laboratory in New London CT. USL’s director was named Horton; he wrote quite a bit about his experience, and in particular he described how right at the start he went down to Key West where the Navy ran a training program. He was encouraged by the results of his first morning’s observations – he was aboard a destroyer that was working with a sub – but then after a lunch break, there was no longer any sign of the target. He asked for an explanation and was told that it was an everyday occurrence, known as “the afternoon effect”. And that turned out to be all that was “known”!! It didn’t take Horton long to recognize that what was going on was the increase in refraction caused by the sun warming the water, and that insight was seen as a revelation. The point of that anecdote is that during WW II we didn’t know enough about undersea acoustics to be aware of the deep sound channel. And we didn’t have apparatus to put sensors down there. And nobody would have dreamed of cabling those (non-existent) sensors ashore. And the depth of the channel is latitude dependent (also not known in WW II). It’s true that an imploding vessel makes a helluva bang (of course you gotta be sure that the apparatus is negatively buoyant): a light bulb is a good choice. I one had a two-foot diameter “float” implode on me (at about 2,000 feet): the sound was audible on the decks of the ships nearby. Oh, by the way, to lend credibility to my posting above, I was Tom Clancy’s technical editor for Hunt for Red October. He didn’t know about the deep sound channel either. You should take a look at the publication..
‘The Cockleshell Canoes’ (google it).. If you want to read about some unknown secrets of WW2 you will enjoy this book esp. if anyone is an engineer or into British Military Maritime History.